I made socks and guess what -- I was able to give him 2 socks. Usually he gets one and the promise of a second (which he gets within a week or so) but this time I was ready for him. 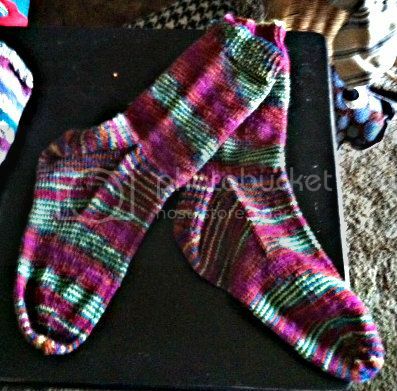 My daughter made him two pair so he will have warm tootsies this fall. Happy Birthday Wally! today is my youngest Daughter's 21st. very snazzy! Happy warm feet day Wally. How "cool", er.... I guess I should say "warm". I like those socks. Happy Birthday Wally!!!!!!!!!!!!!!!!!!!!!!!!!!! Wear them and enjoy the warm toasty feet. Really neat socks! Good job! Happy birthday to Wally. Great socks Dorothy. Well, the yarn does all the work. In the past I always knit him more conservative socks but he seems to prefer the more colorful ones my daughter made him so I went all out color wise this year. Great socks!! Happy birthday Wally! !